How to get on the program "School of repairs"
TV show "Fashion verdict" goes on the first channel and enjoys well-deserved fame. During the telecast there is a "court" over the person who for some reason dresses "wishy-washy". Fashion experts give practical advice to participants and select an appropriate person clothes. 1. A bit of patience. 2. Accused the future party programme, which will be "judged" for lack of style. 3. Clothing of the participant, which, in your opinion, does not fit the accused. 4. The desire of the accused to participate in the program Fashion verdict - the future without the consent of the party not to collect and use personal information. 5. Detailed personal information the hero program, as well as information about the person completing questionnaire (this is, in fact, you): surname, name, patronymic of the party and the hero of the program; city of residence; their gender, age, telephone numbers, e-mail, to create a "support team" you must specify information about friends, relatives, colleagues. Additional information about the hero program: the size of the clothes, shoes, height, weight, detailed family structure. 6. An interesting story is what is based on the entire program. You must describe your living situation, directly connected with the subject of the transfer. Your story. Describe the life situation of the future of the protagonist in all the details . At this stage it is necessary to tell the maximum truthful and interesting situation, in which the main character - why because of the wrong style of clothing, his life has gone in the right direction, how bad taste worsened interpersonal relationships, increased conflict (with friends, colleagues, family). The most important thing is to make it clear to the editors of the program - the story is interesting and could become popular with spectators of the first channel. You must not write two or three lines, and two or three pages, no less. Submission of the questionnaire. 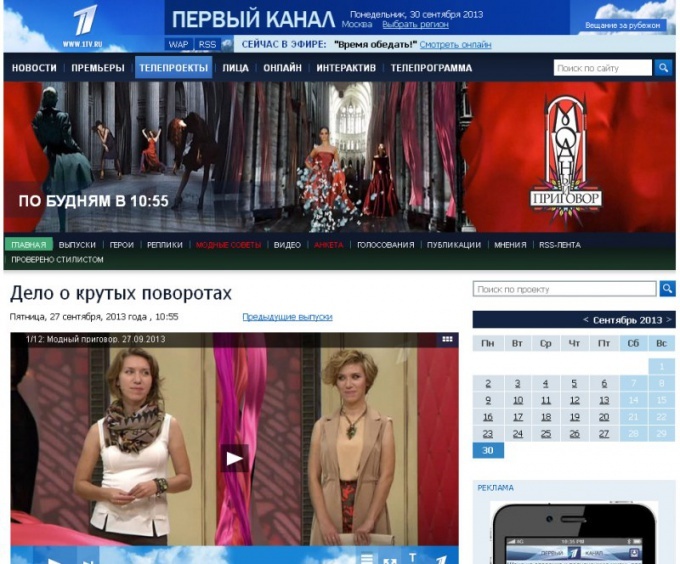 On the website of the first channel in the TV shows section, locate the "Fashionable sentence" - "PROFILE". Complete in detail all the necessary information about you and the future of hero TV. Specify here your story written in the first stage. You'll get a call. Be sure to call - you have to believe in it! The call will inquire about you and the main character. During the conversation you will be invited for an interview at the television station. At this stage the main thing - to show that you know how to communicate and build an interesting conversation. A trip to the television station for an interview. You will need to take a pile, a huge pile of clothes of the main character - all that is, and also the main character. During the interview, show that you are interesting people, sociable companions. And most importantly - make sure that you have an incredibly interesting story! This story, about which it will be possible to remove the clock transmission. Take photos, videos - all that is about the main character - will be useful. Selection of clothes. The creation of an image. The work of a stylist. The interview went really well? Congratulations! Now the work begins a crew, a team of stylists, etc. the Most difficult and the most enjoyable stage. Shooting additional material. Shooting frames and mini-stories for the final transfer. Shooting TV show. The hour. the program was shot with all the stars! Enjoy this moment! Steps 4, 5, 6, 7 are separated by time, so participants from other regions will either have four times to come to Moscow or to stay in Moscow for a very long time. Fill out the form on the website of the first channel and not on the website transfer Fashion verdict. On the website of the first channel of the questionnaire is detailed - you can specify absolutely all the information about yourself, the main character, his family, friends and your history. Try to persuade to combine steps 5 and 6 - that would save time and therefore money. The trip to the interview is a good opportunity to visit Ostankino - it's not every day you can afford it, try to spend time not in vain!